This is our guide on how to upgrade the camp in Red Dead Redemption 2, so you can provide your companions with some nice surroundings. You'll want to make life in your camp as laid back as possible in Red Dead Redemption 2, to give all your companions a safe haven from the law. In this Red Dead Redemption 2 camp upgrades guide, we'll be walking you through a full list of all the upgrades available to you through the ledger, outlining how you can put your money to good use. If you instead need anything else at all relating to Rockstar’s wild west prequel, you’ll want to head over to our Red Dead Redemption 2 guides hub. It’s on this main page that you can find a complete beginner’s guide to the game, as well as tips and tricks, and much more. Firstly, you’ll need to know how to upgrade your camp in Red Dead Redemption 2. You can donate your own money to your camp through the ledger, marked by the dollar sign in a briefcase on the mini-map, and you can then use the ledger, which is right next to it, to make upgrades using the money you’ve accumulated. The only specific RDR2 camp upgrade you can purchase for Dutch’s Tent in Red Dead Redemption 2 is called ‘First Thing’s First’, and costs $220. This is actually one of the better upgrades to purchase once you’ve saved up a bit of cash, as it boosts camp morale, causing members to work harder and donate more money. Pearson takes on the role of the cook around camp, and there are a ton of RDR2 camp upgrades you can purchase for his chuckwagon. Just below, you can find a complete list of all of Pearson’s upgrades, but note that where we list requirements, this means items that you need to have previously donated to Pearson, so that he can make use of them in the future. Less Bland - Costs $30, and stocks fresh fruit and canned foods. Some Real Variety - Costs $45, and stocks chewing tobacco and improved canned foods. Restock - Costs $25, a completely replenishes all food supplies. Strauss takes on the role of camp doctor. 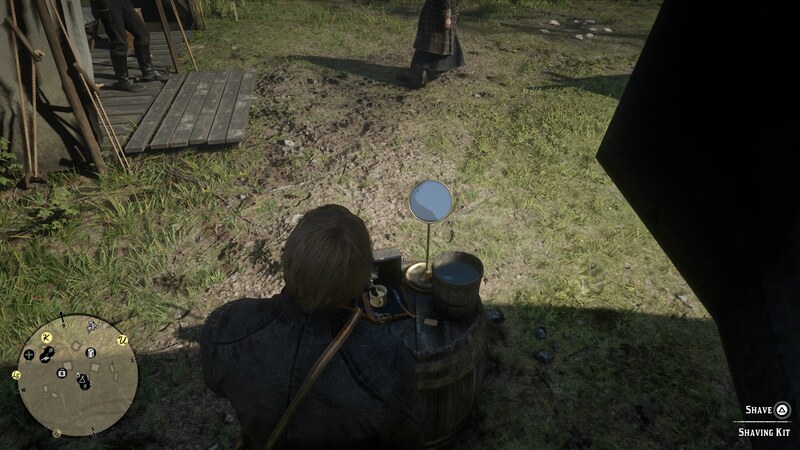 Just below, you can find all the RDR2 camp medical upgrades that you can purchase for Strauss to use, which will then be available for collection at the back of his medical wagon. Sharpen the Senses - Costs $30, and stocks snake oil and potent bitters. Something with a Kick - Costs $50, and stocks tonics and premium liquor. Restock - Costs $25, completely replenishes all medical supplies. Just below are the RDR2 camp upgrades that you can find at the very back page of the ledger. These aren’t tied to any one person or area of the camp, but each one can provide a variety of different benefits for your companions. Chicken Coop - Costs $175, brings more chickens into camp, increasing the healing powers and Dead Eye boost of the stew. Leather Working Tools - Costs $220, allows Pearson to craft a greater range of upgrades. Horse Station - Costs $300, provides more hitching posts for horses, lets you bring in horses to camp, and lets you recall your main horse to camp. This might be the end of our camp upgrades guide for Red Dead Redemption 2, but we’re far from done with Rockstar’s game here at USgamer. You can check out our Red Dead Redemption 2 legendary animals guide, or our Red Dead Redemption 2 cheat codes guide for more.